We even went as far as traveling to places like Australia, Indonesia, Hawaii and California to audit, learn and compare surf lessons. 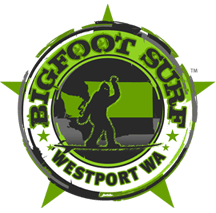 What we discovered is the BigFoot Surf Coaching Model more than stands up to to the scrutiny of fellow professional coaches, and in our student’s opinions outperforms other surf lesson models currently being taught by big name surf schools primarily built for the tourist industry. We think we have developed a sustainable surf lesson progression that turns our students into life-long surfers, this was our motivation all along and we are confident we have accomplished this goal. Deciding to start a surf school was easy, we’re super passionate about teaching surfing, actually doing it is a totally different story. As we got into the administrative side of the business we learned that the Washington State Parks Department has standards set forth for any business operating commercially in state parks – be it for profit or not for profit recreation, lessons, or classes. The rules and regulations are straight forward (mostly) but the fines are hefty and we wanted to be legit and avoid any potential for litigation. So we got down to Business! After a lot of research, hundreds of phone calls, and miles of red tape we have accomplished our goal. We now have in our possession the one and only Commercial Use Permit to teach Surf Lessons at State Parks in Washington and Insurance to go along with it. We would like to thank Army Captain Adam O., the local Westport Surf Shops, friends, family and fans who have been supporting our surf progression experiments and all the challenges that it took for us to develop, case study and implement an excellent surf lesson model. Thanks for your patience – we’re now open for business. Look for us on the weekends at Westhaven State Park, Westport Wa. See you in the water! Learn-To-Surf, it’s fuel for your soul!